Miriam Sagan and Isabel Winson-Sagan are a mother/daughter artistic collaborative team, “Maternal Mitochondria.” Isabel is a multi-media artist and Miriam is a writer. We share a studio in rural Santa Fe. Our collaborative process began early in 2014, when we went to Iceland in dead winter in search of the northern lights and the experience of darkness. We were housed part of the time in the SIM international residency in Reykjavik. We hadn’t expected to collaborate, but there in a womb-like environment ended up working together to produce a collection of photographs and poems. It’s not always easy for us to work together. We’re two women from different generations, life experience, and aesthetics. The ancient bond of mother and daughter is fraught with issues of identity and control. Also, visual artists and writers work quite differently—and much of that work is solitary, not done with someone else. Our issues are often about who is leading at the moment—and about communication. But it is precisely these potential problems that give us our sense of risk and adventure. 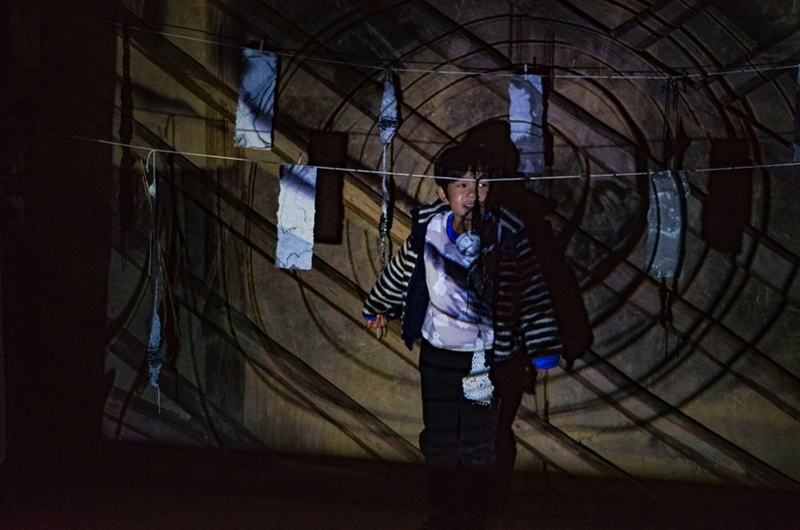 We are currently focused on the site-specific installation of suminagashi and text. Suminagashi is traditional Japanese marbling. The effect is beautiful, but it is also a meditative practice to quiet and focus the mind. It is composed by allowing a basin of water to still, and then adding ink to the water. The ink can be traditional black calligraphy ink, or more modern colored ones, including acrylic. The pattern is composed by adding drops of ink within each other. As they expand, they create the traditional fractal look of mountains and rivers, or coastlines. The pattern can then by manipulated by blowing on it, using a brush, or even a hair to gently move it. It is said that a master of suminagashi has only two percent control of the outcome. After some trial runs, we realized we needed to be together and immersed in the same environment, creating both the marbled paper and the poetry at the same time. Site specificity is always enhanced by the use of local water—from well, reservoir, watershed, etc.—in the suminagashi. Subject matter derives from the time, place, and from the ecology of the terrain. Mother/daughter collaborations are rare, although sons have often worked with fathers in the crafts and the arts. We share an interest in “mapping,” particularly as suminagashi can look like a topo map. Our projects are cross-generational, multimedia and feminist derived. We spent a very productive week at a residency at Wildacres in North Carolina in the Smokies in October, 2015. Our collaboration developed as a result, including a crossover of skills: at Wildacres, Miriam learned suminagashi and Isabel wrote daily. We produced a limited edition of a small book of photographs, suminagashi, mixed text/image, and poetry to showcase our experience. In summer of 2017, we spent two weeks in residence at Herekeke Art Center on Lama Mountain, north of Taos, where the challenge was to see the familiar New Mexico landscape in a fresh way. Here we added monotype printing to our repertoire. We are also working on an ongoing poetry geocache project. After doing some local geocaching, we designed a poetry installation (written on suminagashi and hidden in egg shaped containers) for a trail at Santa Fe Skies RV Park. Rather to our surprise, this had the unlooked for effect of increasing walkable creative tourism. Geocachers experienced the park and RVers enjoyed it as an activity. We plan a permanent walk—with changing seasonal exhibits—in 2018. This January, we had the incredible opportunity to be in residence at Kura Studio in Japan (Itoshima, Fukuoka Prefecture.). We lived in “House Three”—a chilly traditional Japanese house that became the container for so much creative activity. Our installation was heavily influenced by the constant presence of Shinto shrines as casual sacred space in our neighborhood. The shrines were decorated with folded white paper chains and hanging rice turf for New Year’s. Our piece, “Thresh/hold” was installed in the actual “kura”–an ancient square grain silo with metal door and interior wood paneling. 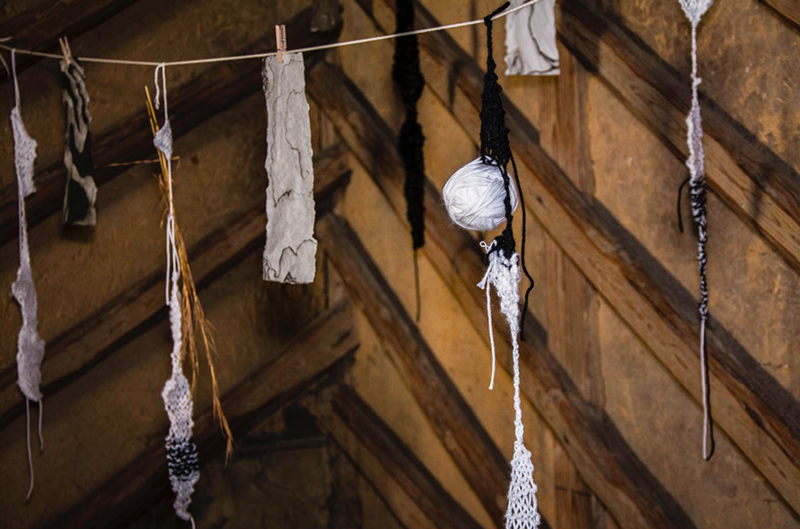 It was composed of hanging pieces of suminagashi and knit pieces. 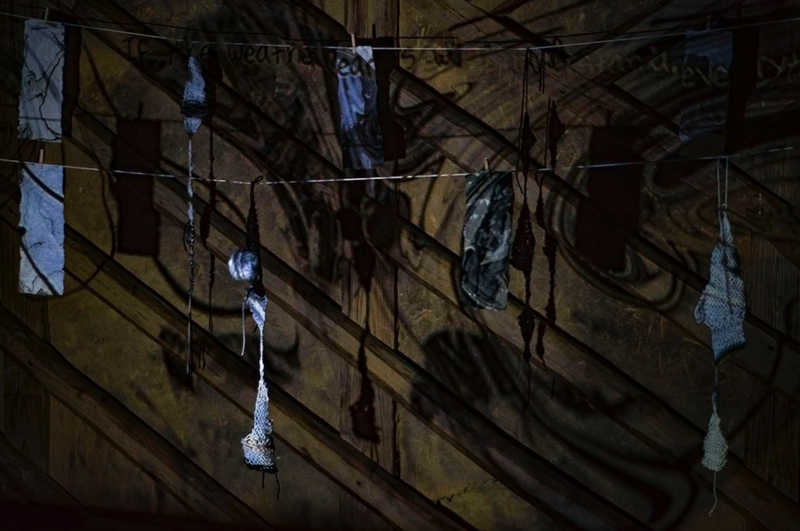 We created a video that was then projected onto the hanging lines, of the suminagashi process and ten poetic questions that were jointly written. Here they are the ten questions in bilingual format. New Year in Japan, the paper store is closed—who owns these clouds? My mother sings at the Ikisan station—will I be a good mother? New house slippers—purple with polka dots—what is the name of the three-headed Buddha? 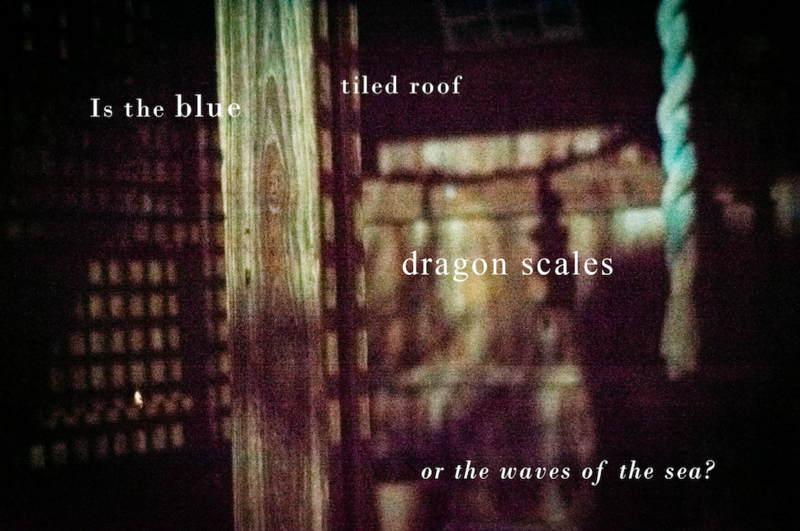 Is the blue tiled roof dragon scales or the waves of the sea? Thunder clap awakens me—will my cold go away? Dark, light, dark, light from the train window—how long can I go only eating noodles? What is the relationship between language and reality? A steamed pork bun, red tea kettle. Cranes out on the river bed. Or— boys in soccer shorts? If the weather clears will I understand…everything? Was I here before, and if so, why am I still lost? To come to Japan, we had to cross many thresholds, physical, emotional, and spiritual. A threshold is not just a boundary, but a way of collecting, gathering, and storing. This also refers to the ties between us as mother and daughter, and references local shrine and temple decorations. We used traditional craft materials–knitting and suminagashi–along with poetry that derives from the linked Japanese form of renga. The poetry asks a series of questions about our experience—maybe without answers—but worth asking. At Kura Studio, we also did a Teapot Haiku geocache along with our silo installation. 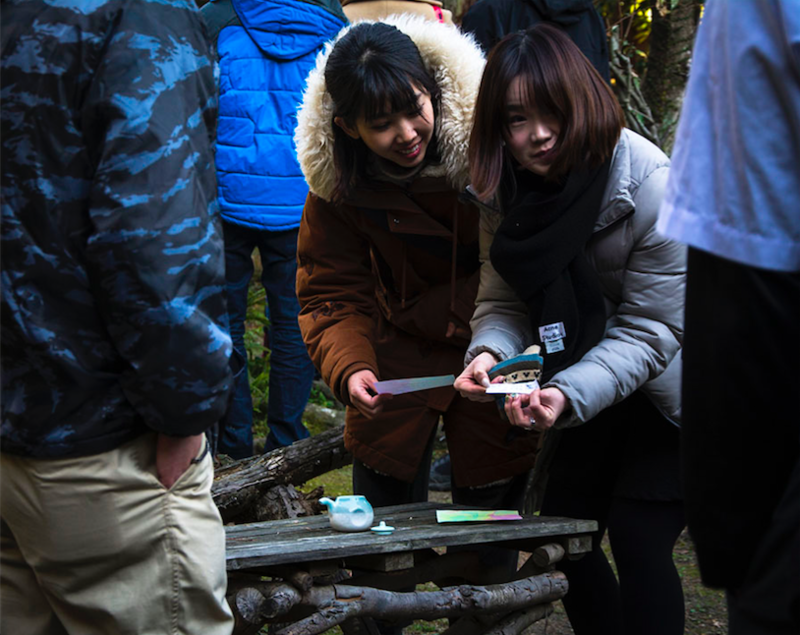 Each visitor was handed a colorful piece of suminagashi with GPS coordinates on it. This led to a lovely garden in the back of the complex. We were very grateful to the owner for permission to use it. 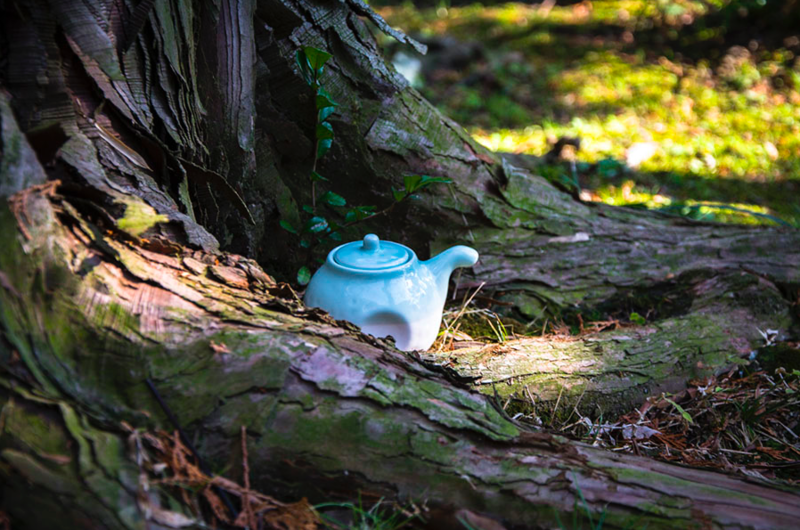 There were five tiny teapots placed on the site. Why five? Because the 100 Yen store, a few train stations away, only had five. 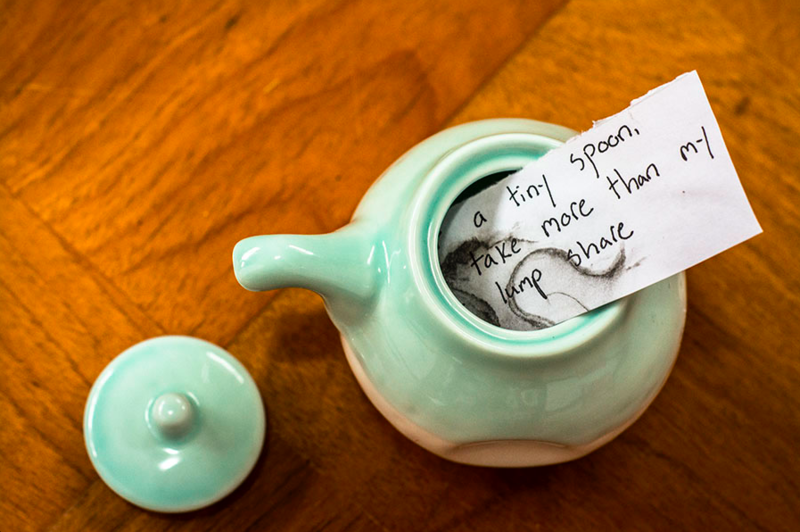 In each teapot was a “hot drink” haiku written by Miriam and transcribed by Isabel on to a small scroll of suminagashi. The piece was very simple. We really liked using a mass produced container, hand made scrolls, original text, and a beautiful traditional setting. The pathway was site specific in so many ways. It also combined low and high views of art in a way that interested us. Working together in Japan was a transformative experience, and one that continues to influence us in ways we can’t even yet fully understand. We were engaging in three- dimensional space more profoundly—everything from walking at night through rice fields following our flashlight beams to transforming the interior space of the silo with video. We came off our “page” of paper, ink and poetry while taking all those elements along with us. Our next project, Summer 2018, is a poetry and suminagashi and text geocache for the Railyard Park in Santa Fe. We will take a group of about twenty people through all the stages of marbling and writing, and then curate their products into a pathway that reflects shared consciousness, time, and place. This is public art, created by the public itself, to express and reflect part of our hometown. 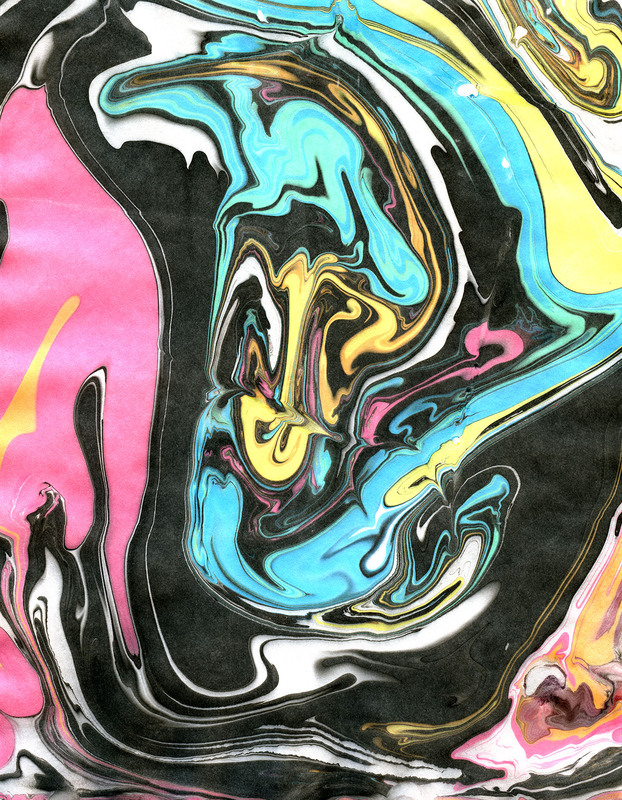 Example of suminagashi by Isabel Winson-Sagan is from Spilled Ink, a collaboration by Isabel Winson-Sagan and Miriam Sagan. Swimming in Reykjavik, a poetry and photography collaboration in e-book format created during a SIM International residency in Iceland, was originally published by The Moon Publishing and was reissued in 2015 by Baba Builders. Lama Mountain, a chapbook of Miriam’s poems and Isabel’s suminagashi from their collaboration at the Herekeke Art Center, near Taos, New Mexico, is available from Red Bird Press in Minnesota. Isabel Winson-Sagan holds a B.A. in religious studies from the University of New Mexico. She is currently studying intermedia fine arts at Santa Fe Community College. Her work has appeared in several online and print magazines, as well as several gallery shows. Her two books, in collaboration with poet Miriam Sagan, are the e-book Swimming in Reykjavik (The Moon Press) and Spilled Ink for which she did the typography and design. As part of this continuing mother/daughter collaboration, Winson-Sagan has been an international artist in residence at Studio Kura in Japan, an artist in residence at Wildacres in North Carolina, at a printmaking residency at Herekeke Arts Center in New Mexico, and for a short term guest residency at SIM House in Iceland. Her website is isabelws.com. Miriam Sagan is the author of over twenty-five books of poetry, memoir, and fiction. Her recent collection Seven Places in America includes residencies in the Everglades National Park, Petrified Forest National Part, Andrews Experimental Forest, THE LAND/an art site, and Stone Quarry Art Park. She has also been in residence in a trailer at the edge of a bombing range in Great Basin with Center for Land Use Interpretation and at Gullkistan in Iceland She has received the Santa Fe Mayor’s Award for excellence in the arts and a Poetry Gratitude award from New Mexico Literary Arts. She founded and ran the creative writing program at Santa Fe Community College in New Mexico until her retirement in 2016. She blogs at Miriam’s Well (miriamswell.wordpress.com).